Everyone seems to have a strong opinion of President Trump - be it positive or negative. Yet, he has been changing some hearts and minds this week with his trip down to Texas. 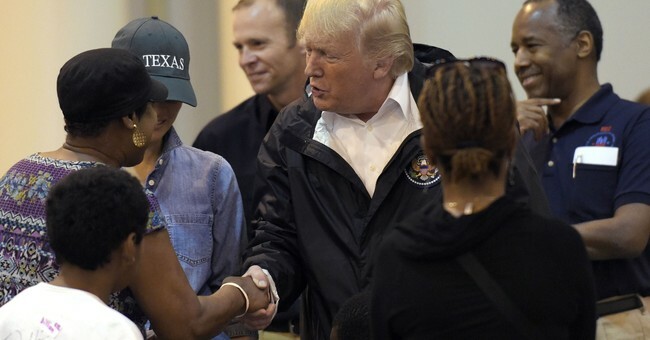 Trump and First Lady Melania spent some time serving meals, hugging kids, and taking selfies with the hurricane survivors at Houston's NRG Center. Elex Michaelson, a reporter from a local ABC affiliate, was on the scene to speak with some of the survivors who got to brush shoulders with the commander in chief. They told the anchor that were surprised by who they found. "I had a different opinion of him," one woman said. "Now, I think he's a wonderful man." Others were overjoyed that the president had handed them their meal. Another survivor noted that while many politicians are only interested in photo ops, Trump was "sincere." "As tough as this was, it's been a wonderful thing," Trump said of the love he witnessed at NRG. Not everyone was pleased. As you'll see in the video, one young woman broke down crying about how she could not bring herself to talk to the commander in chief because she was "angry" about his past comments about Mexicans. Emotions are unmistakably high - in Texas as well as Capitol Hill. Lawmakers are hoping to avoid another post-Hurricane Sandy debacle in 2012 when they fumbled the relief package, unable to come to a consensus on a number. For Harvey's relief efforts, Trump has asked for Congress to approve an $8 billion spending package. Harvey has taken the lives of at least 44 people and caused widespread destruction. Texas, FEMA Administrator Brock Long said, could take years to rebuild. However, the storm has provided us some incredible moments of bravery and humanity. The list of heroes who bravely waded into the water and jumped in to cars to save victims seems endless. Here's how you can make your own heroic contribution.